The refugee problem is a difficult one. Thousands of refugees from war-torn countries are flooding into Europe every day. It’s both tragic, and dangerous, but there’s really no way around it, because Europe has been checkmated. Sharia law is coming to the continent, and there’s no longer a damn thing they can do about it. Islam has made forays into Europe in the past. Hungary, even Southern Spain has served as the leading edge of earlier Islamic invasions. Warfare and trade were the modes of transportation of their religion and way of life, in the past, but in modern times, they have figured out a much better way to bring Europe under the Caliphate. It’s hard to sneak soldiers into a country pretending to be refugees. It doesn’t take long for even the slowest state leaders to figure that one out. Why recruit, train, equip and deploy soldiers at your own expense, when your enemy will do it for you? That’s what’s going on here, and if Europe doesn’t figure it out soon, they are doomed. The leaders of the Islamic world are clever, cunning, completely evil, and most importantly, patient. They are creating chaos in the Muslim world, killing their own people, and driving them from their homes. Many end up as refugees in European countries, who are looking for ways to address their shrinking populations. Too many old people, not enough babies, in countries like Germany and France. They need people willing to work for lower wages than natives would accept, but also professionals, like doctors and lawyers. By creating war, the Muslims are seeding the fertile grounds of Europe. Hundreds of thousands, eventually millions of Muslims will find refuge in European countries, settle in, and have children. No matter how much they are needed, do you really think a Muslim boy is going to grow up well-adjusted, respected and appreciated in Germany? Or, not to single out the Germans, will the French accept and admire him? No. He will not have the same opportunities native Europeans have, and he will grown up to resent it. He will be radicalized, and used as a tool of the leaders of Islam. This boy, once he grows up, will be a weapon that was created, funded, educated and fed by parents who only wanted a place of freedom and opportunity for their children to grow up in. In many cases, the governments will shoulder a great portion of the cost, and that investment will be stolen by the Caliphate, when it radicalizes the next generation. To see this happens, the Islamic world will not be thankful for Europe’s offering of refuge, but will sew violence in order to see that the continent’s newcomers are never easily integrated into European society. They will work hard to make sure the children of the next generation have a difficult time being Muslim, growing up in Europe. The harder their lives, the easier the job of radicalizing them. It doesn’t matter whether these tools are used to kill, or simply to change the culture through elections and societal pressure. Europe will become Muslim, under Sharia law. Bet on it. “Justified” series finale – Who (if anyone) will leave Harlan alive? I love Justified. It’s a great show, Elmore Leonard to the core, with some of the best dialogue television has ever had. The best season was #2, with its pilot “The Moonshine Wars” introducing us to Mags Bennett, probably television’s strongest female character ever. The last couple seasons, however, have been driven by the conflict between Timothy Olyphant’s (Deadwood) character U.S. Marshal Raylan Givens and long-time criminal, Boyd Crowder, played expertly by Walton Goggins (The Shield, Sons of Anarchy). When the two meet in the pilot, they smile and hug, and seem to be genuinely glad to be reunited. Raylan has just been kicked to the Marshal’s district of Eastern Kentucky, where he was born and raised, after shooting a Miami “gun thug,” who absolutely had it coming, but for some reason the action pissed off Raylan’s bosses. As Raylan says later, “I don’t know why they give us guns,” he clearly has a view of his duties that differs from the Marshal’s service. Boyd is set up in the pilot as the clear bad guy, blowing up a church and then shooting one of his men, who he suspects of being an informant, in the head. The pilot is based on Elmore Leonard’s short story Fire in the Hole, and ends with Raylan shooting Boyd in the chest. Leonard had Boyd dying, but Justified showrunner Graham Yost saw the chemistry between the two characters, and had him survive the shooting. 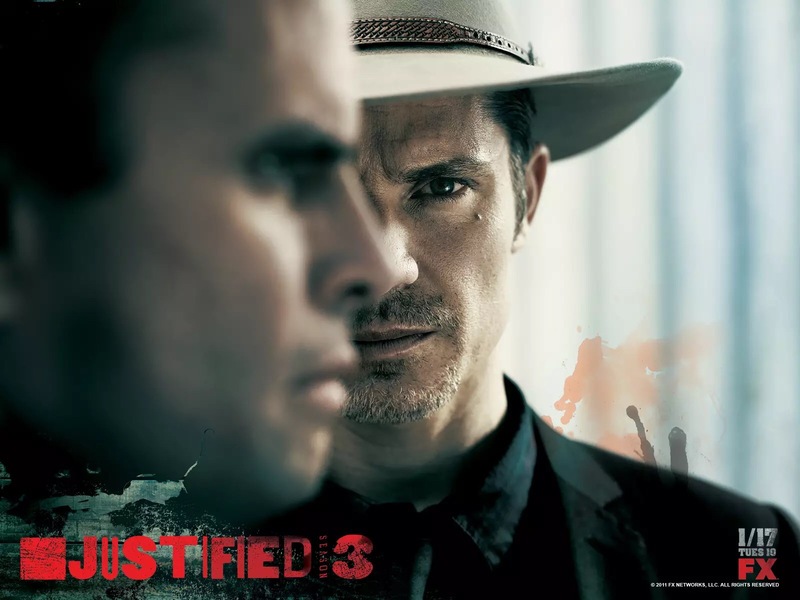 Instead of a game of cat-and-mouse, Raylan and Boyd have been engaged ever since, in a game of cat-and-cat, sometimes on different sides of a fight, often on the same side. They save each other’s lives, and seem to be tied together by their shared pasts. What tonight’s finale supposedly comes down to is the final squaring off of the two men, but honestly, this battle has seemed to me to be a MacGuffin, a plot device that to me, just doesn’t feel right. I am confident that Yost will end the show in the right way, and I’m hoping for this season’s creepshow character “Boone,” a young gunslinger who desperately wants to add a notch with Raylan’s name on it will meet his end by way of Boyd’s gun, saving Raylan. Yes, there’s a certain symmetry to beginning and ending the show with Raylan shooting gun-thugs, but that doesn’t really resolve the Raylan/Boyd situation, so I’m hoping for a more creative finale. The Loretta McReady storyline coming around full-circle, with the young girl becoming Eastern Kentucky’s new Mags Bennett, is quite satisfying. I hope both Raylan and Boyd are able to leave Harlan alive, but don’t.